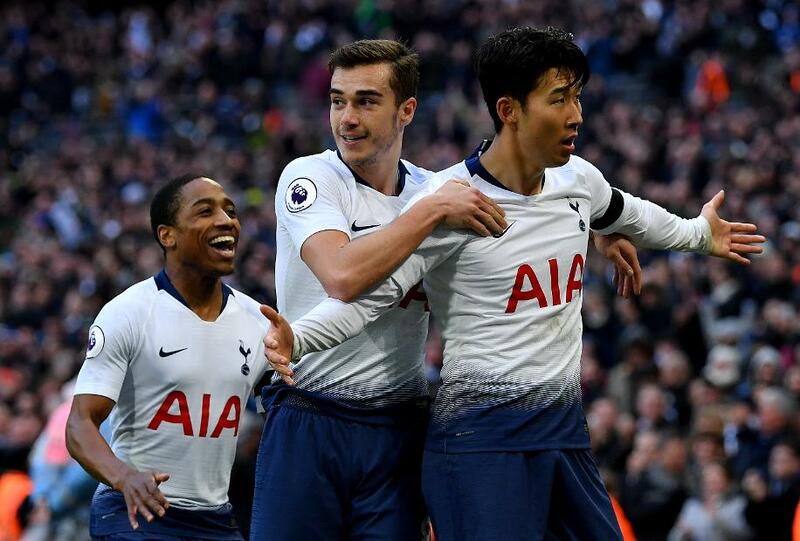 Tottenham Hotspur maintained pressure on the Premier League's top two with a 3-1 win against Leicester City at Wembley Stadium. Harvey Barnes flashed a shot wide in a lively start for the visitors, before a smart corner routine resulted in Davinson Sanchez heading Spurs in front from Christian Eriksen's 33rd-minute cross. Leicester might also have levelled on 58 minutes after Jan Vertonghen fouled James Maddison in the area and Jamie Vardy came off the bench to take the spot-kick, but Hugo Lloris saved his penalty. Eriksen's sweet shot found the bottom corner three minutes later, and after Lloris made another fine save from Barnes, Vardy gave the Foxes hope when turning in Ricardo Pereira's cross with 14 minutes left. However, Son Heung-min burst away to settle matters in stoppage time. Spurs' 20th Premier League win keeps them third, on 60 points, five behind second-placed Liverpool.